On iOS 10 or earlier, when users subscribe to a new podcast, they would always get the most recent episode downloaded to their library. Starting with iOS 11, Apple added support for two types of podcasts. There’s also new episode types: full, trailer, and bonus content. 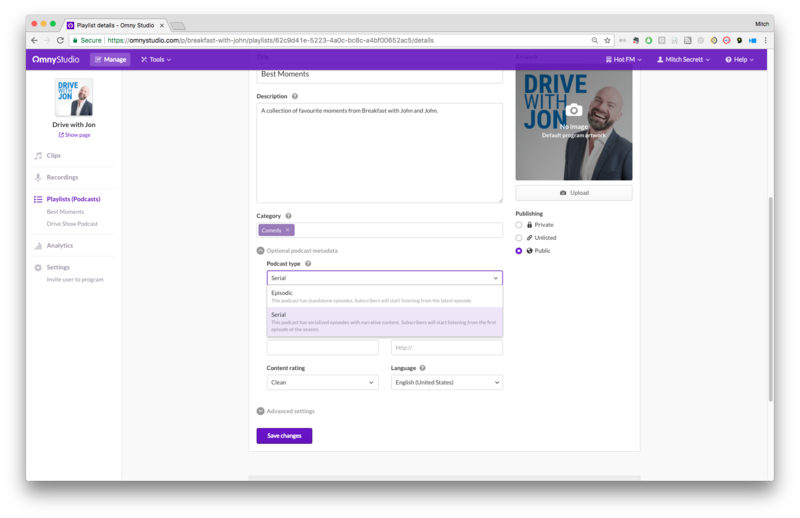 Once you've identified which style of podcast yours is, take these steps to update your podcast in Omny Studio. If you have an episodic podcast, you don't need to change your playlist since that is already the default. Optionally, if you wish to add season numbers to your episodes, you can do so by editing the clip, expand the "Optional metadata" section and add a season number. With episodic ordering the newest episode will always play first and the latest season will always be displayed. In the playlist details page, expand the "optional metadata" section, and for the "Podcast type" dropdown select "Serial". Add season and episode numbers to your episodes in the clip details page under the "Optional metadata" section. You can only number your seasons and episodes with a number (cannot use letters or symbols). Then you're done. Your podcast will display seasons and episode numbers in the Apple Podcast app. Note: The Apple Podcast app does not appear to enforce episode ordering so serialized podcast episodes still appear in date descending order when viewing available episodes.